With our powerful but low-cost software and your team's Excel expertise, you can tackle a real problem, leverage the data and analysis skills you have, get results in months not years -- and move easily to the cloud. With our software wizards, guides, support, and online courses, your analysts and developers can do the work of "data scientists" and "management scientists," and grow your own analytics team expertise. What you need to know: Data Science (Predictive Analytics and Machine Learning), while not new, are more actionable than ever. They enable you to use all your data to make classifications and predictions, on a case-by-case basis. For example, instead of an overall sales forecast, you can make predictions about each individual customer’s likelihood of buying (or “churning”). Here's the Wikipedia description of Data Science. In the past, managers couldn’t answer both kinds of questions in an integrated way. But now you can … if you have the right analytical and model-building tools. What you need to know: Management Science (Prescriptive Analytics and Operations Research), while not new, are more actionable than ever. They enable you to make complex resource allocation decisions – where there are thousands of individual decisions and/or uncertainty about each one – to reduce costs or mitigate risks. Here's the Wikipedia description of Management Science. To do this, you need data, but you also need models of your present or future business situation (marketing plans, manufacturing lines, distribution system, financing practices, etc.). The models you need to apply optimization, simulation, and other management science methods are not like the 'models' used in data science, which are standard forms (logistic regression, neural networks, etc. ), 'trained' or fitted to past data by machine learning methods. Building these models requires a person with knowledge of your business -- how a specific function works -- modeling software capable of expressing your business situation in quantitative terms, and solver software to apply optimization and simulation algorithms to your models. 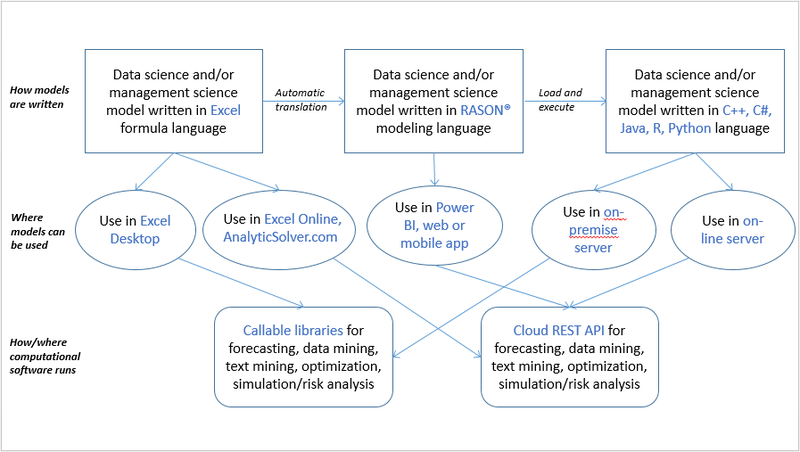 Analytic Solver® software is a uniquely comprehensive, integrated platform for both data science and management science. Your business analysts can create models in Excel and/or our RASON® modeling language. Your developers can create models in RASON and/or a programming language (C++, C#, Java, R, Python). And they can use all three, without rework! Leverage the expertise of people you already have. Accelerate time to value, from modeling the situation to deploying a solution. Leverage your team's modeling investment and software investment: Use them in both Microsoft Excel and the cloud at AnalyticSolver.com. Create models you can easily deploy in Excel, Excel Online, Google Sheets, Tableau, Power BI, your own website or mobile app. Create analytic models once, easily deploy them wherever they're needed. Express your model in Excel, in RASON (most flexible! ), or in C++, C#, Java, R or Python code. Analytic Solver empowers you to use and re-use your models and your software licenses, in desktop Excel, Excel Online and Google Sheets, Tableau and Power BI, our cloud platform AnalyticSolver.com, or your own application on a server, web page or mobile device. Instead of spending money on consultants for a one-time project, wouldn't it be better to build analytics expertise in your own team? Don't underestimate the potential for the business analysts and developers you already have to do the work of "data scientists" and "management scientists". This is especially true if your people already have the "domain knowledge" about your business and industry. For years, Frontline has played a major role in management science education: Our software is featured as the main or only data science and management science software in dozens of textbooks. It's being used right now in over 500 university MBA business courses. In fact over time, more than 500,000 MBA and undergraduate students have learned about analytics using our software -- some of them may be in your organization! We offer our own webinars, online courses, and modeling support, and we can connect you with an array of university and private educational institutions. A great way to start: Click a link to register for a free webinar: New live webinars every other week. Your team members can learn via an online course at Solver.Academy: New courses start each month. Ask about our “combo offers” for software licenses plus online courses: Students can get an Analytic Solver Basic software license with their first course!